Here we are in England. We arrived in Portsmouth on Monday the 24th. As we came up to the key (sic) I was looking out for Jamie who had gone in Mail Steamer “Pekin” and I was astonished at not seeing him, but as soon as we were made fast I heard he was very ill-had been brought ashore sick and was at Southampton. The news gave me quite a turn, for we were all so well and we expected to start off at once. However, as soon as I got my luggage passed, we got ashore and got to the hotel where I left Letty and the children and started off for Southampton where I found Jamie in a very low state; but the sight of me seemed to act like magic on him, poor fellow, and I think (it) done him more good than all the doctors could do. He had been very ill with fever and is skin and bone, scarcely able to stand. I had hoped to have been able to take him with me-but I went to see the doctor and he thought he was too weak to be moved, so I returned to Portsmouth by the last train and made arrangements the next morning about my spare luggage being sent on direct to Edinburgh by goods train, where it will remain till I arrive. Then we all started for Southampton and wasn’t Jamie glad to see us all once more together-he was much better, his head was nice and cold and skin moist. Jamie had a nice night of it last night; had a good refreshing sleep and I think he will pick up fast now he has kind faces round him. We had a very good voyage. 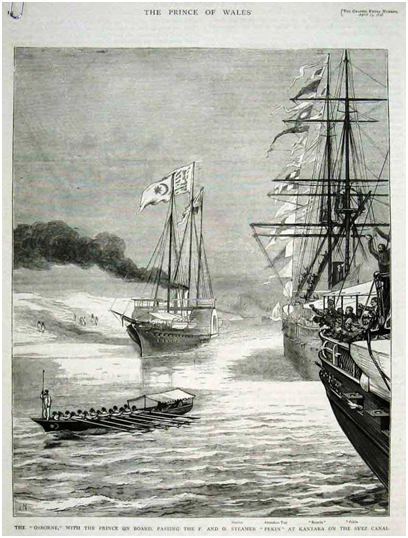 We left Bombay on the 23rd March at 11.30 and we arrived on the 24th April just one month and a day. Letty stood it better than I expected she would and was the only one that was sick, and that was little. She was a fine ship, I never saw one like her before-we had altogether on board about 1500 men women and children, including the ships officers and crew. We lost 3 men and 3 children at sea and one child the morning we came into Portsmouth-they were all Invalids-and those that died were bad cases when they came on board, but I will tell you all about the trip when I see you. Letty is quite delighted with what she sees of England, the shops take her eye and the prices of things compared to what we have to pay for inferior articles in India. We are all very anxious for Jamie to get a little stronger and then we will be off. I told you in my last (letter) that I would call on Aunt Agnes on my way home, but I won’t stay-however, I will write and let you know when we start. Should you want to write to me, direct to me at Aunt Agnes at Cambridge. We are sitting at tea with a nice coal fire and gas burning, which is quite a treat. Letty and the children send their love to you and are all anxious to get home to you. I’ve got a bad ‘hoast’ with a cold I’ve got. (Editor’s Note: It is not clear as to how long James Johnston and his family stayed at home before returning to India. Clearly from the next letter following this one, he returned perhaps a couple of months before 11th October 1878).